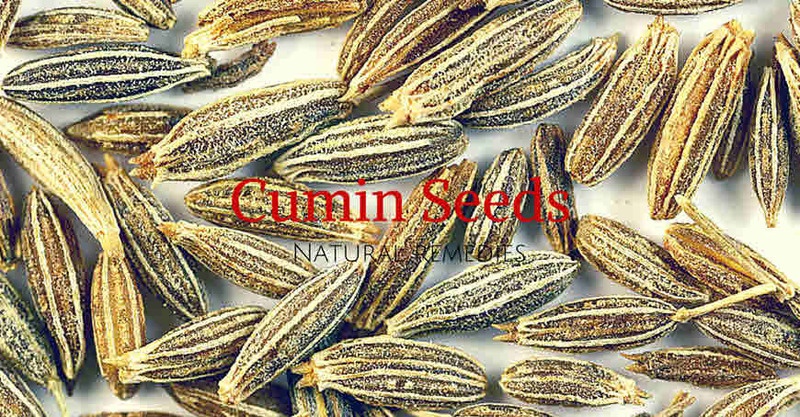 Know about medicinal properties and various medicinal uses of cumin seeds. It is most common spice in kitchen and very good for health. Cumin seeds which we used commonly in our kitchen is also known as Safed or Shwet Jeera. It is used in Indian kitchen as whole seeds or in powder form. It is one of the ingredient of spice mixtures that are used in preparation of curries. The botanical name of cumin is Cuminum cyminum and belongs to family Umbelliferae. It is a medicinal spice that can be used to treat various common ailments. It is given to breastfeeding mothers to improve quantity of breast milk. During pregnancy, its use in less amount does not pose risk but when taken in excess it may stimulate uterine muscles and labour. Cumin is native to the Mediterranean region. It was originally cultivated in Iran and the Mediterranean region. In India it is cultivated in Punjab and Uttar Pradesh. Cumin plant is an annual herbaceous plant which grows up to 15-50 cm height. It has a long, white root. The leaves are 5-10 cm long, pinnate or bi-pinnate, with thread-like leaflets, blue green in colour and are finely divided. Whitish-red flowers are on a compound umbel. Fruits are elongated, oval shaped schizocarp. Cumin seeds are sown in Feb-March and flowers in June and July. Seeds ripe after four months of the planting. Cultivation of cumin requires a long, hot summer of 3-4 months with daytime temperatures around 30 °C. The plant is resistant to drought and requires fertile well-drained soil. As per Ayurveda, jeerak or cumin seeds has the following properties. Effects on Tridoshas (Humor): Pacifies all the three doshas. Action: Dipana (means digestive stimulant, the action of kindling agni), Grahi (means anti-diarrhea, binds stool), Krimighna (removes worms), kapa-vata har, Pachana (means digest ama/toxins), Ruchya (means stimulate taste). Cumin seeds are antimicrobial, anti-diabetic, antiepileptic, antifertility, anticancer, antioxidant and the immunomodulatory. These medicinal properties are due to the presence of various chemical constituents such as volatile oil 2.5 to 4.5%, 10% fixed oil, proteins etc. The volatile oil mainly consists of 30 to 50% cuminaldehyde, small quantities of a-pinene, b-pinene, phellandrene, cuminic alcohol, hydrated cuminaldehyde and hydro cuminine. Here is given, how to use this very common spice for medicinal purpose. Cumin seeds are used traditionally to stimulate menstruation, so do not use in pregnancy. 1. Improving breast milk: Eating roasted cumin seeds helps to improve quantity of breast milk in new mother. Make laddu of roasted cumin seeds and wheat flour. Or roast cumin in ghee and add in Daal and eat. 2. Uterine fibroid: For making this medicine, take equal amount of dried flowers of Woodfordia floribunda (Dhataki), Cuminum cyminum (Jeera) and Symplocos racemosa (Lodhra). All three ingredients are powdered. These powders are mixed with jaggery or crushed raisins. Large pill or bolus are prepared. One bolus twice a day is prescribed. 3. Digestive weakness, Deranged Vata/wind: Take cumin seeds powder 4 grams with jaggery, an hour before eating meal. 4. Ajeerna, indigestion, colic : Roast cumin seeds 3-6 g and make powder. Mix with rock-salt and take with warm water thrice daily. 5. Diarrhoea : Roast cumin seed 3 g and grind to make powder. Add this in glass of Chhachh or curd and take orally 3-4 times a day. 6. Fever, Visham jwar: Take cumin seeds powder 5 grams. Extract 20 ml Kachnaar bark juice. Mix the two and take thrice a day. Eat 1-3 g. powder of cumin seeds with jaggery twice a day. 8. Insomnia, difficult sleeping : Roast 3 grams cumin seeds and make powder by grinding. Mix this in mashed banana and eat before going to bed. 9. Painful swelling in piles: To get relief from painful swelling in piles, make a simple preparation by boiling 5 grams cumin seeds in 400 ml water till volume reduces to 100 ml. Filter this and add sugar. Drink this twice a day. 10. Parasitic worms : Take 15 grams cumin seeds and boil in 400 ml water till volume reduces to 100 ml. Filter and drink. 11. Leucorrhoea, abnormal bleeding: Take cumin seeds powder with misri/sugar candy twice a day. 12. Scorpion sting: Make a paste of cumin seeds, salt and ghee. Mix honey and apply at place of sting. 13. Spider sting: Make a paste of dry ginger powder (sonth) and cumin powder. Apply externally on place of sting. Drinking cumin tea is very good for health. It is beneficial in treating digestive, respiratory and urinary problems. Cumin tea has sedative effect and if it is taken at night helps to induce sleep. This tea helps to improve breast milk in lactating mothers and also shrinking of the uterus to normal state.